With a busy autumn coming in our Church we need to take stock and plan for all the events and happenings in front of us. We are facing reduced numbers in church mainly resulting from members sadly dying, moving to care homes, leaving the area or attending church more infrequently. We are not on our own and most churches are seeing decline in attendance. The Annandale Group of Episcopal Churches is currently discussing how we face up to these challenges, what steps can be taken to arrest these trends. Finance is an increasing problem for the Group and whilst some Group Churches have reserves to weather the storm, some do not. 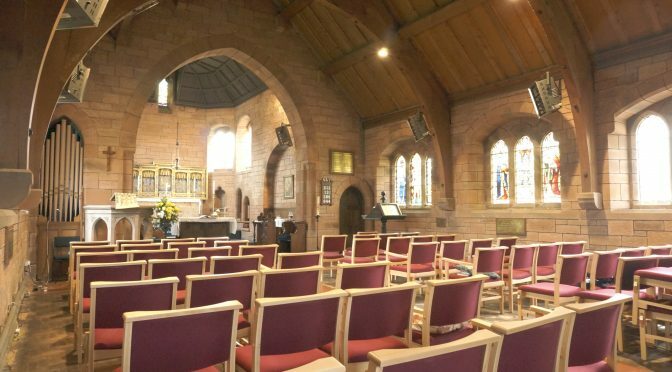 We have completed one of the major elements of our Mission Action Plan with the removal of the church pews and development of a more flexible church building. We now have the opportunity to hold a variety of events and this Newsletter brings forward details of those this Autumn. Hamilton Church members will be visiting Lockerbie on Sunday 28th August. They intend to arrive around 1pm and visit Lockerbie town and its surroundings. Whilst here, we will provide a BBQ (they are bringing their own food) and as usual, Ian and David will perform their culinary skills. Hopefully we will get a dry day. Saturday 24th September will be a very important GIFT DAY. This replaces our annual Coffee Morning in the Town Hall. We realised that many people were spending considerable sums putting together their stalls, purchasing bottles, buying ingredients for baking, purchasing raffle tickets and prizes. We hope therefore that we will instead give similar amounts to that which we had been spending directly to the Church Gift Day. Please come along on Saturday 24th between 11am and 1pm, have a coffee/cup of tea and a chat and make your donation to the Church. Bring a Friend Sunday on the 25th September gives us an opportunity to welcome someone you know to our form of worship possibly from another ‘church’ or new to the area. We will be making a special effort to welcome guests and guide them carefully through our liturgy. Refreshments will be served after the Service. Thursday 13th of October sees us modifying the church to provide a catwalk for a Red Cross Fashion Show. The evening event should be great fun and provide funds for our Church and other important causes. Lynne Prhal is organising this event along with Red Cross staff from Lockerbie. Models of all kinds and helpers are sought to make this a great success. In particular we need to sell tickets to friends and others to ensure a good audience. Saturday 29th October at 7pm sees us with an evening of Shakespearean drama. Maggie Macleod and other volunteers will read, recite, act and perform a host of parts. Musicians and budding bards needed please contact Maggie. It will all be great fun though no doubt tragic and hilarious. Almost certainly there will be props and bits of costume. Following the Shakespeare evening Maggie goes off to a season of panto in Hamilton and Rutherglen. We hope to organise a group from All Saints to go and see her in the pantomime. News of this later. All Saints are setting up a stall at the ‘turning on of Christmas lights’ in Lockerbie on Saturday 19th November. We will be selling a variety of items including Christmas logs.